While some corps have been hard at work the last couple of weeks vying for money as part of the Chase Community Giving charity campaign on Facebook, a few others have been getting a "refresher," participating in other grant programs to pull in needed funding to support their organizations' operations. The Pepsi Refresh Project is an online campaign where supporters can vote for the ideas they think should receive the millions of dollars of grant money the soft drink giant gives away each year. During the month of May, both the Spirit of Atlanta and the Open Class corps Forte are looking to secure a total of $75,000 between the two of them. 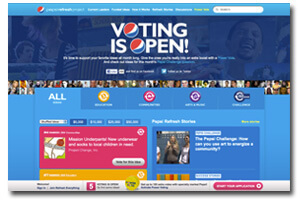 Receiving grant money through the Pepsi Refresh Project is dependent on the power of fans' votes. Voting runs through Tuesday, May 31, and supporters have the opportunity to vote for their favorite groups once per day, with five votes per person to go around. Forte is in the running for a $25,000 grant, which Pepsi will award to up to 15 groups in the month of May. The corps would like to use the money on new front ensemble instruments and food service equipment. According to director Chris Green, Forte currently rents all of its percussion keyboard equipment and has just outfitted a portion of a new semi-trailer for the 2011 season as a mobile kitchen. "While Forte has a long term business plan that it has been strictly following, a $25,000 grant would allow us to move these two big items for the 2012 season up to 2011," Green said. 2. Text* 105940 to Pepsi (73774) to vote from your mobile. Another DCI corps, Spirit of Atlanta, is also in the running in the Pepsi campaign in the higher $50,000 tier which will be awarded to up to 10 groups. The corps, having previously participated in this program in the winter, hopes this time around to get a hold of the grant money to support its ongoing expenses on the road specifically for food and equipment. 2. Text* message: 106204 to Pepsi (73774) to vote from your mobile. Learn more about the Pepsi Refresh Project. With annual costs to put a drum corps on the road each summer on the rise due to the increasing costs of food, fuel, housing, equipment and more, corps are continually looking for additional sources of income to support their organizations. The Mandarins are currently participating in a grant program run by northern California supermarket chain Raley's that could earn them $5,000 to use toward purchasing new instruments and uniforms. Like the Pepsi Refresh Project, "Raley's Reach" lets supporters vote online for their favorite groups. The five groups with the most votes at the end of the campaign, which is quickly coming up on Friday, May 13, will receive the awards. As of today, the Mandarins are in fifth place. Learn more about the Mandarins' Raley's Reach campaign.